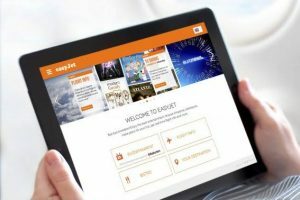 Available on more than 30 airlines worldwide*, Euronews joins EasyJet’s newest Air Time entertainment offer, developed by Immfly, currently deployed on the British carrier’s fleet. Thanks to the onboard wireless network, travelers of the Europe’s second largest airline company (with more than 78 million passengers per year) can now access the free service via their personal devices. Euronews’ inflight offer on board EasyJet includes articles on international news, business, culture, sci-tech and European affairs, all available in five languages: English, French, German, Italian and Spanish. The inflight entertainment and services platform is developed in partnership with Barcelona-based company Immfly, which also offers Euronews on Iberia Express, Volotea and XL Airways. *Euronews’ content is available on board 34 airline companies from China to the Emirates, from Russia to the United States, through the Seychelles and Australia. Air carriers choose Euronews in order to meet their international travelers’ demand for a quality source of information. Euronews’ short-format videos available in several languages seem to be just the ticket.